Vogue sewing pattern based on an original 1951 Vogue design. 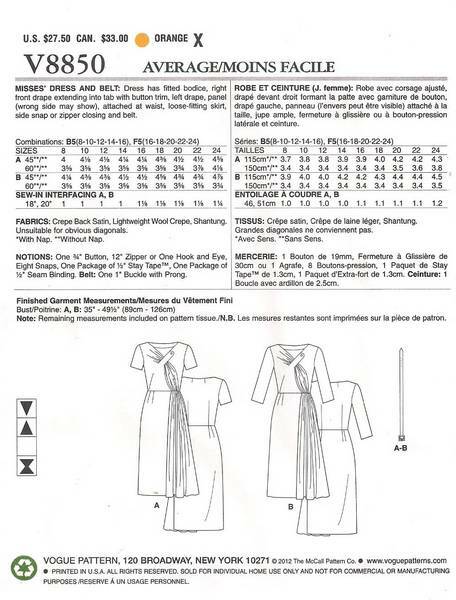 Dress has a fitted bodice,right front drape extended into tap with button trim, left drape, panel attached at waist (wrong side of fabric will show), loose-fitting skirt, side snap or zipper closing and self fabric belt. Bust 38, 40, 42, 44, 46. Waist 30, 32, 34, 37, 39. Uncut and complete. Copyright 2012.